The @DavidGeurin Blog: What's Most Valuable Attitude or Technique? Your team just upset the #3 seed, and for the first time ever, your school will advance to the Elite Eight of the NCAA Tournament. And then you're asked this question by a 13-year-old reporter from Sports Illustrated Kids. Kudos to Frank Martin for how he fielded this question from the kid reporter. It was a great moment. The coach showed the kid all the respect and sincerity he deserved in that moment. But it was, after all, a great question. Our school has enjoyed its own March Madness story this year. Our boys basketball team made it all the way to the state championship game. It was an incredible run with some unbelievable comeback victories along the way. We didn't win the championship game, but our players played like winners. Our coach has a mantra he uses to outline the core values of his program. E-A-T. There is no substitute for consistently trying hard and giving your best effort. Your positive attitude is a gift to yourself and others. 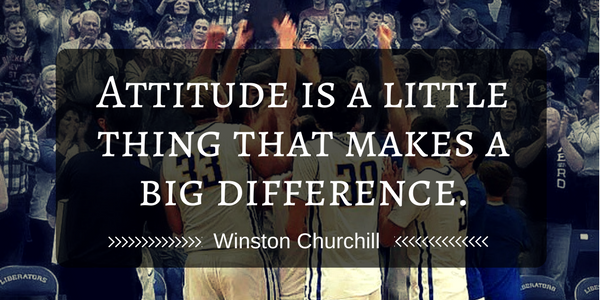 Your attitude will determine your impact in life. Be a great teammate. Care about others ahead of yourself. Be unselfish. The messages from Frank Martin and from Robby Hoegh (our coach) are essentially the same. Attitude is more important than technique. You might not have the greatest talent level or the best technique (...yet), but you can always show up with great effort, enthusiasm, and energy. It's hiring season for schools all across the country. What is most important to you about who joins your team? Do they need to have the most sophisticated teaching strategies, the best understanding of subject content, and the most proven track record? Those things aren't bad. In fact, they are all important. But what's most important is that you bring people on your team who are winners. You want people with winning attitudes. You want people who are on a mission to make a difference. Who are good teammates. Who bring positive energy every day. Who will continue learning and growing. And who want the best possible learning experience for EVERY kid. If those qualities are in place, it's impossible to NOT grow in your technique, knowledge, and effectiveness. Developing these aspects of your CHARACTER is more important than your PRACTICE. Who you are is more important than what you do, because what you DO will always flow from WHO you are. Question: How can we generate more focus on Effort, Attitude, and Team in our school cultures? What is your school doing to promote these qualities? I want to hear from you. Leave a comment below or respond on Facebook or Twitter.